When Howard Weinstein set out to replicate his family's fondly-recalled 1971 LTD 4-door pillared hardtop, he faced only one problem: there's never been a plastic or resin kit of this subject. 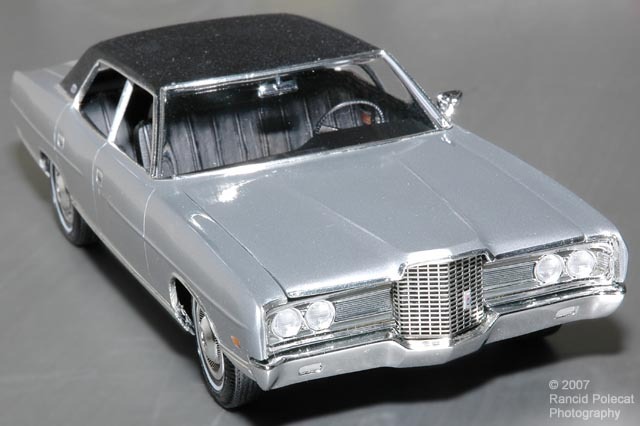 Because the full-size 1970 and 1971 big Fords shared body shells and chassis, the readily available AMT 1970 Galaxie police car made a logical starting point. After two years and countless alterations, Howard finished what he jokingly calls a "Frankenstein" conversion, with parts scrounged anywhere he could find them. Prominently featured above is the 1971 LTD's distinctive grille and bumper. It took parts from five different kits to replicate the grille. Howard had to merge two 1971 - 1972 style Mercury Cougar bumpers (one donated by fellow MAMA member Dave Toups) into a single, wider LTD bumper.He also widened a Cougar hood into the LTD's Power-Domed hood which caps off the photo-etch emblazoned grille.